Grab a big red marker, turn to September on your calendar and draw a nice big circle around Friday the 26th. Add a few stars for effect, and write the following words in all caps: USC Law School Groundbreaking.Then make plans to be here and be a part of one of the biggest milestones in the school’s almost 150 year history as we officially break ground for our new 187,000 square foot building. Located on Gervais Street, between Bull and Pickens streets, the new building will help form the state’s “legal corridor” along with the State House, the S.C. Supreme Court and the National Advocacy Center, as well as many downtown law firms. Each element, from classrooms to courtrooms to available technology, has been designed with flexibility in mind, allowing USC Law to meet the rapidly changing needs of legal education well into the future. We hope you’ll join us for this historic day! Want to attend? 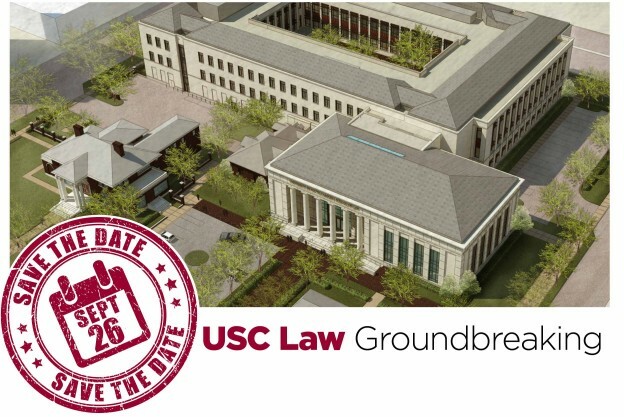 Let us know by registering at usclawgroundbreaking.eventbrite.com.